This topic of this post shouldn’t be a surprise seeing as how I gave a big hint at the end of the last post. 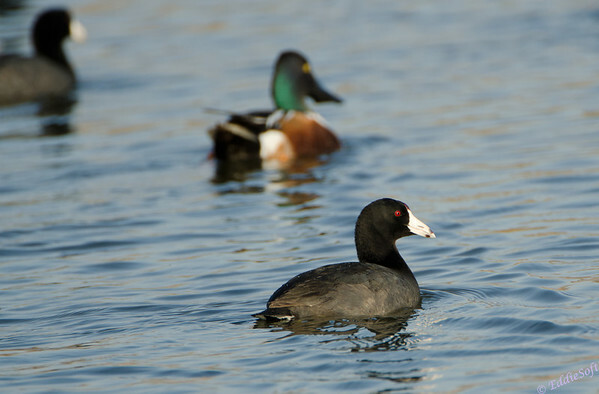 As the Northern Shoveler fades into the background, his friend the American Coot takes the stage. This is actually not the first time this particular bird has graced these pages. If you recall we kind of called them out in the Yellowstone post (link here). However, there is one big difference from that appearance and today’s entry…. 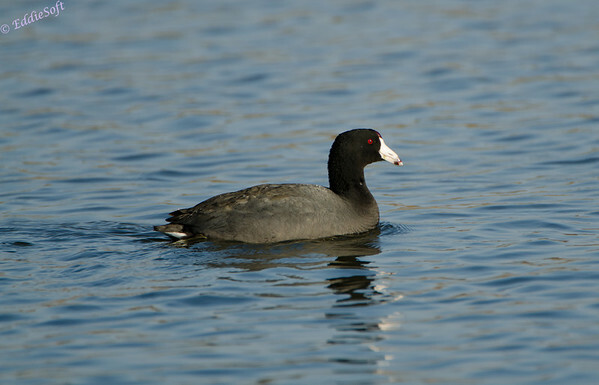 in this post you can actually tell it’s a Coot. One thing I was not aware of from the first pictures was just how bright red their eyes are. Guessing this one just flew in from Vegas after having a really good time. As with the set before (and the upcoming ones) these shots were taken at Emiquon National Wildlife Refuge which is located in Havana Cuba.. err make that Illinois. By the way, somehow the individuals that named this town got the pronunciation of it right. For some odd reason in our State the similar named cities and towns have butchered soundings – Athens, (strong A), Cairo (Kayrow), Rio (Rye-O), Milan (Mylan), Des Plaines (non-silent s), my favorite San Jose (San Joes) and Goofy Ridge. Okay, so the last one doesn’t fit but I had a quest to reference that scary location in one of my blogs and it was time to get that off of the to-do list. I wonder if I started calling it HavingNah if it would catch on. 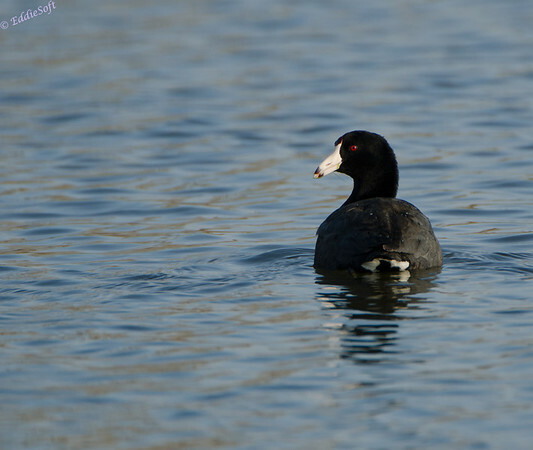 Apparently this particular Coot didn’t appreciate my little joke about his hometown – giving me that stern look-back every 6 year old knows good and well. (and yes, that is the EXACT age I felt when coming up with the title for this post). It would be un-American to pass up the opportunity to draw up a reference to our childhood when confronted with a bird with that name. For the record, Linda is usually the one who makes the reference first! Hit the jump to see more the set — don’t miss the take-off shots! One thing I noticed about these Cooties is they tend to hang in packs. To this point I have not actually seen just one of them hanging out alone in the water. According to the guide books they’ll winter in the thousands. We were not at that number on this visit but it would not be a stretch to say they were 2 to 3 hundred enjoying the choppy waters. Turns out identifying these birds is pretty easy. No other duck has the white chicken mimicking beak. 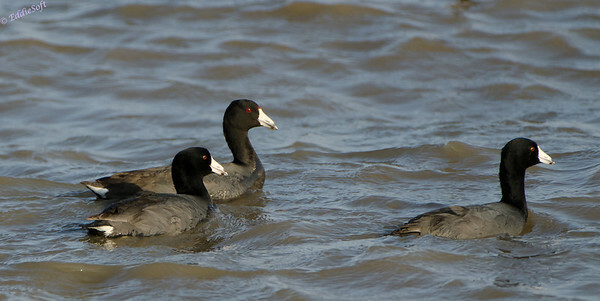 I would also say the red eyes give them a unique visual (especially against the black) but I am aware there are other birds sporting this color (maybe even one coming up soon in this blog – but only if you eat your vegetables and clean up your room. As far as coverage goes, these birds pretty much have North America covered. There appears to be some gaps up in the high New England states, but other than that they extend well into Latin America and far into the Maple Leaf regions. I could not verify this in any resources, but from a birder’s perspective they tend to be on the overly cautious side. The second the barrel of the Beast raises up toward them they start shifting out further into the water. They tend to keep their eye on you as they push the distance which makes for excellent photographic composition. 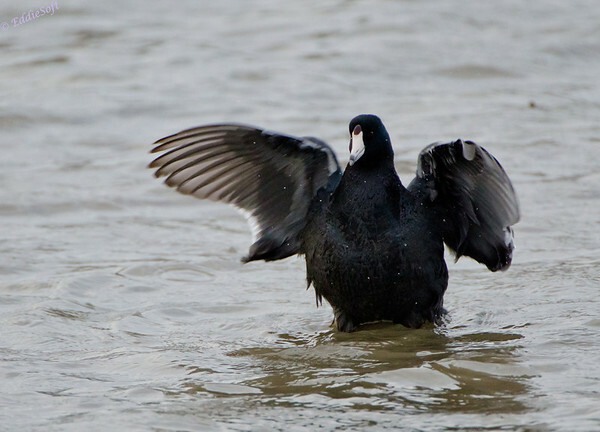 As much as I enjoy watching these American Coots relaxing on the water soaking in life, it takes a backseat to how entertaining it is to see these birds take flight. The spectacle of the takeoff is hard to really capture in pictures (especially zoomed out over 500mm) but I did buckle down and apply all my bird photography skills (cough-luck-cough) to give you a sense of what it looks like. Imagine, if you will, a roadrunner dashing across the top of the water. This process is not just one or two steps before gathering the wind up under the wings and lifting out of the water like more traditional ducks (Mallards etc.) Nope, there are several steps – the ones we were watching were easily in the >8 range but some of them looked like they were just showing off to the ladies and would keep running back in forth in front of them. Eventually their foot splashes start to less and their bodies begin to lift out of the wet stuff. The one at the bottom was just about to make it out of the surf in this shot. It was a little premature in the lift and clipped the water again, but the wings furled up and it was soon souring through the air. As difficult as it is for these guys (and gals) to get up in the air, they make up for it in their abilities once up there. They can move – evident by the fact I have no pictures of them in flight – it is going to take more practice to get the Beast on spot and the exposure set quick enough to get that picture in the tin. Truth be told I would set up the shot and have Linda walk up near a bunch of them. At least one or two would choose the flight route (at least I don’t shop hehehe). I hope my dear wife doesn’t try to kill me for that comment. Other Illinois names that have incorrect pronunciations or accents include Marseilles, New Berlin, and Paris (and more that I can’t recall). Did you know that Romeoville was named because of the nearby city Joliet? Thanks for this latest photo essay. Do you have a movie mode on your DSLR? The running on water might make a fun series of clips. Linda, you have simply got to beat Brian this year in the photo competitions at the fairs. Brian manages to refer to U.B. in _every_ single post. Maybe you are just fine with that, but I doubt it. 8^) I’m rooting for you! Ah yes, New Burlynn but how is Paris pronounced? Paireyes? I do have a movie mode on the D90 and the D7000 both sporting HD quality. 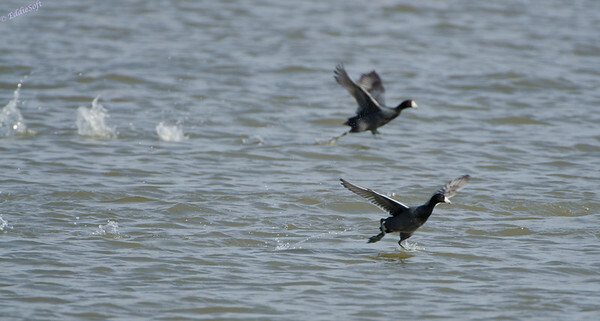 Next time I am out with the Coots I’ll try to capture a quick video of their takeoff. I am not very confident in the video realm and the few times I have used it at the dog show I have been disappointed so no promises. I need to go back and do some validation – I doubt I’ve reference the family U.B. in EVERY post. She is clearly proud of being my U.B. and appreciates the fact I take the time to recognize her contribution to the photography shoots. Clearly none of this would be possible without her impressive eye for the sun (to know where to properly place the umbrella), her sense of weather (let’s me know when it is going to rain) and crowd control when the thousands of fans come flocking for my insights and autographs. You act like the U.B. role is somehow degrading .. quite the contrary, she gets the opportunity to improve her BIF (birds in flight) shots – based on her own admittance she has a ways to go in that area (wait until the Wisconsin shoot makes it to the blog) and since she gets to stand so close with the umbrella she can see all my secrets.